Please download the Easy 3-Step Detoxification Symptom Questionnaire to determine your potential body burden. We all need to clean house. Knowingly and often unknowingly we absorb toxins into our bodies on a daily basis. Some of these toxins our systems can handle well, but there are many that the body cannot address effectively. It is estimated that 80,000 chemicals exist today in industry and 30,000 find there way into our foods. These poisons can interfere with critical internal pathways that can lead to a gambit of health issues, including cancer. 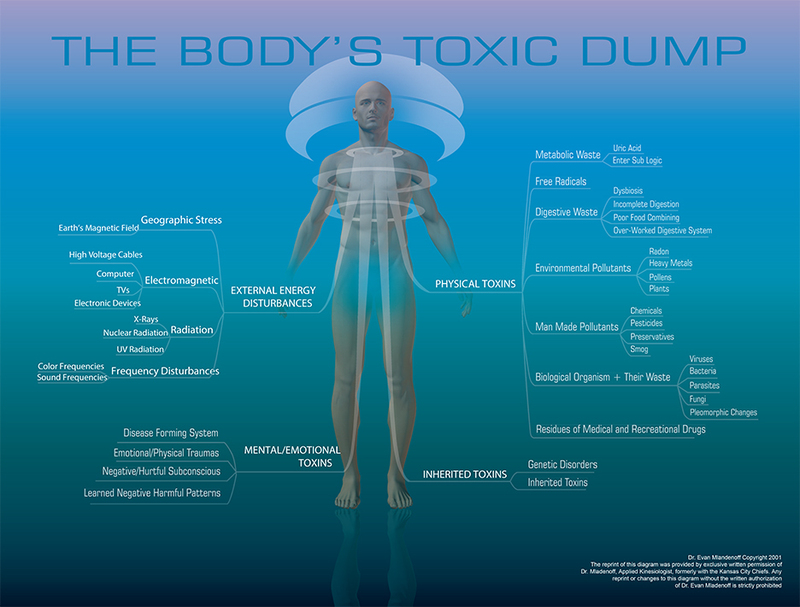 What are Symptoms of a Toxic Body? Common symptoms of a toxic body can include brain fog and confusion, migraine headaches, chronic fatigue, lack of rejuvenating sleep, poor sleep, digestive issues, inability to lose weight, emotional instability, arthritis, auto-immune disorders, fibromyalgia and multiple chemical sensitivities. Our process addresses the nine most common underlying causes of chronic health challenges. We employ a doctor monitored, 3 step process produced by Biotics Research Corporation that deals with these nine challenges in an easy to follow step by step plan. Focuses on reduction of inflammation. Common food allergens are removed from the diet. In addition, chiropractic care may be employed to ensure proper nerve flow, as well as anti-inflammatory nutrients. This phase typically lasts 7-10 days. Consists of a thorough program to address the toxic burden, pathogens, heavy metals and leaky gut issues. This step may include continued chiropractic visits, a diet plan, and nutrients that encourage the natural detoxification of the body. This program is not a weight loss plan; however, some weight is lost due to elimination of stored toxins. This phase can last 10 – 20 days. Focuses on repair and regeneration by providing the necessary building blocks the body requires for repair of damaged cartilage, joints, and tissues. This step employs a diet plan and nutrients that the body commonly lacks for repair. This phase of the plan is encouraged as a lifestyle change to maintain optimal wellness and avoiding the reintroduction of toxins.